Not many new bikes coming in the Rs 4-7 lakh price range, but the ones that are, have been long pending or much awaited. The Benelli TRK 502 has been a part of our ‘upcoming bikes’ story for two years straight, and it hasn’t yet seen the light of the day. However, we’ve concrete information now that Benelli will finally launch the TRK 502 in India. The Benelli TRK 502 is powered by a 499cc, parallel-twin engine that puts out 47bhp and 45Nm. There will be two variants – the TRK 502 and TRK 502 X. The TRK 502 X will be more off-road focused and will get a 19-inch (front) and 17-inch (rear) spoke wheels. The standard TRK will come with 17-inch alloy wheels. The Benelli TRK 502 range is going to be priced between Rs 5 lakh and Rs 6 lakh. Although there is no official word from KTM India as yet, the 790 Duke has frequented the headlines over the last few months. It started October 2018, with rumours of the India launch towards the end of the year. Dealerships seem to have commenced bookings of the 790 Duke for a token amount of about Rs 30-40,000. On its launch, the 790 Duke will become the flagship offering in the KTM range in India. This orange monster gets its firepower from a 799cc liquid-cooled parallel-twin motor that develops 103bhp and 86Nm. Just like all other Duke models, expect it to be a light-weight offering bursting with performance. 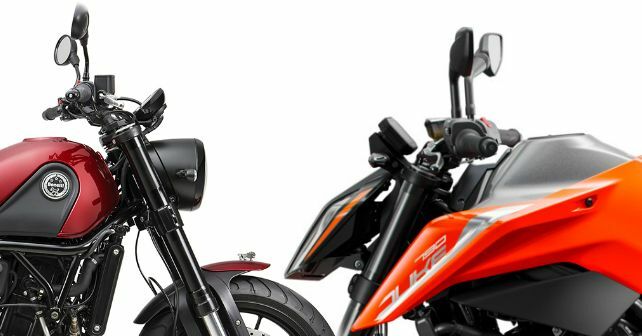 In terms of features, it comes with a slip-assist clutch, cornering ABS, supermoto mode, motorcycle stability control, a TFT screen for the instrumentation and more. Last year, Kawasaki brought in the Ninja 400. We ride it recently to find that it is indeed the perfect size motor that you’d possibly need for a country like India. Sadly, the Rs 4.69 lakh ex-showroom price tag that it carries is a bit too heavy for its shoulder. But if you are still convinced about buying a Kawasaki 400, they are expected to bring the Z400 to India later this year. The Z400 comes with the same 399cc parallel-twin motor that develops 48.3bhp and 30Nm of torque. The engine will continue to be paired with a 6-speed transmission. In fact, apart from the naked body and a marginally upright stance, there isn’t much that will be different from the Ninja 400. Just like the TRK 502, we have been expecting this one too for about two years now, but this year it might just be launched. The Leoncino was first unveiled at EICMA in 2016. It is a scrambler styled modern motorcycle that will build it niche here in India – the only closest competitor to the Ducati Scrambler or the Triumph Street Scrambler – both of which are considerably expensive and more powerful. The Leoncino, on the other hand, is based on a 499cc parallel-twin liquid-cooled motor that pushes out 47bhp and 45Nm. This is essentially the same motor that will also power the TRK 502. The front is mounted on 50mm USDs while at the back it gets a monoshock. Initially, Benelli is expected to bring the Leoncino in two trims – standard and trail, with the latter being fitted with a 19-inch wheel at the back. There is no official confirmation about the launch and variants as yet.